The Freedom Principle is an album crackling with energy. Consisting of three long tracks, none shorter than 11 minutes, the album is full of bristling creativity and expression, never feeling tired or lost. Rodrigo Amado is a musician and photographer from Lisbon, Portugal (check out his artist home page; in addition to his discography, he had a link to his pictures and a photo book, all very nice), who was involved in the burgeoning free jazz scene there in the mid to late 90's. The start of Clean Feed enabled many of the artists, including Amado, to record their music and get international exposure. He had the first release from that label, The Implicate Order at Seixal. Amado sees himself as carrying the tradition of saxophone players like Coleman Hawkins, Sonny Rollins, Archie Shepp, and Sam Rivers, taking his knowledge of jazz and his own creativity, and channeling it with energy and focus. On The Freedom Principle album from NoBusiness, his working trio with cellist Miguel Mira and drummer Gabriel Ferrandini is joined by trumpeter Peter Evans (from New York and member of the International Contemporary Ensemble - ICE). The title track is a 25+ minute opus that grabs the listener right from the start; Amado playing like Sonny Rollins in free form, with Ferrandi complementing, and then the others join in. Evans pushes Amado with an insistent tone that punctuates, sometimes lurking in the background, other times adjacent to the sax playing. About halfway through both horn players engage in an active dialogue that recalls that late 60's New Wave in Jazz scene, playing on top of each other, then along side, folding and turning their music in rhythms and tones that maintain the listener's interest. There's a lot to digest, and on repeated listens it gets more rewarding. Shadows is an 18+ minute experience in volume, going from the terrific playing of Mira and Evans, playing at an almost whisper, the cello squeaking and trumpet mouthpiece blowing, to a more aggressive and louder interaction when Amado and Ferrandini join in, cello and sax vibrating, becoming very intense, then back down low, then loud again, Evans in full voice, stretching and pushing his instrument to the limit. Pepper Packed (a tribute to Art Pepper?) has Evans leading off with a solo, then Ferrandini, then a duet with Ferrandini and Mira, with Amado finally joining in with a more relaxed sound, almost ballad like, but the rhythm section plays against that notion. On this final track one can hear Amado's influences, and the very clever way he integrates them into his own sound. 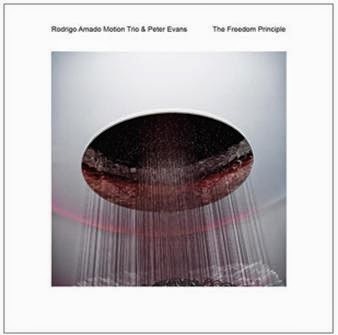 The Freedom Principle is a high point for everyone involved, and a reaffirmation that the traditions of jazz are not dead, but cleverly integrated into new sounds and stories, by artists like Rodrigo Amado and his group and Peter Evans. This gets my highest recommendation!